Design from Cathy de France. Lidia absolute very nice and so beautiful. Lovely design .All your doilies are excellent so nice Hugs Stella. Thank you, Carmela, and welcome to Cute Embroidery! Lovely design Lidia! I love all your doilies! Your work is so neat. Unusual design, remarkable execution, love it! Just beautiful - I haven't browsed Cathy de France.in a long time. Going to have to go have a look :-) Thanks for sharing. Great design and you did it justice. What an unique and graceful doily, and a complement to that gorgeous vase! Nicely done! Thank you, Penny. 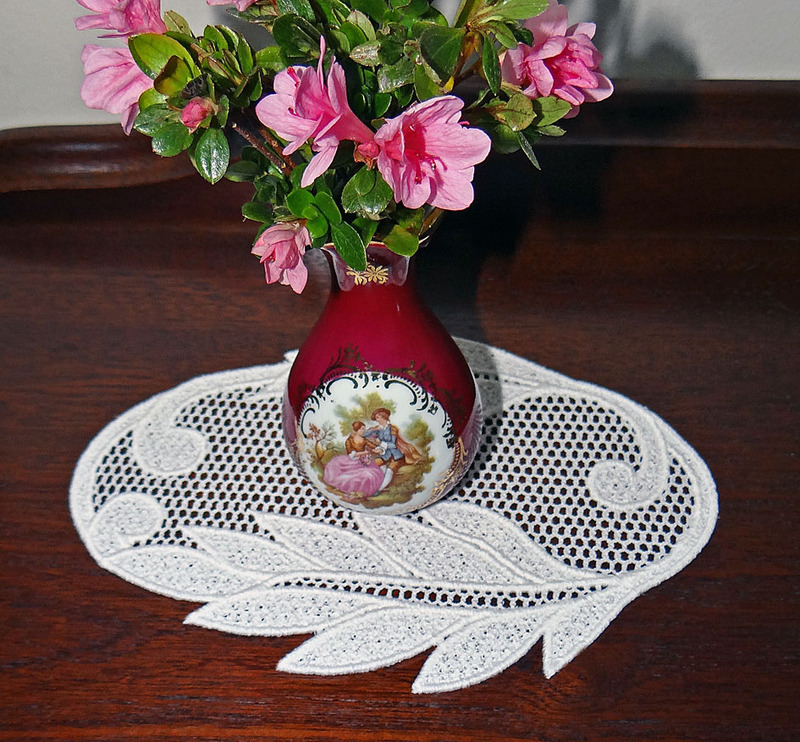 Since the doily design is from a French digitiser, I thought that a French vase was appropriate :-). Thank you, my friend. 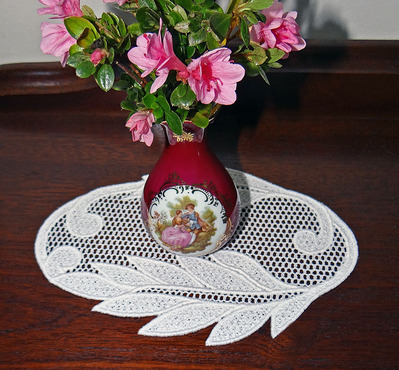 This doily is very easy to stitch out and uses one colour only. Je n'ouvre jamais mon ordinateur sans voir d'abord vos conceptions épatantes. C'est magnique ce que vous faites. Vos idées m'inspirent, Merci. You won't be disappointed, Avis. Gorgeous design. Not a typical doily design. You are right and Cathy is one of my favourite designers/digitisers. You won't be disappointed, Cathy has beautiful designs. Grazie, Dionisia e benvenuta a Cute Embroidery! Beautiful work. Can you tell me how many stitches there are in this doily please? There are 55317 sts. Thank you for your comment. Love it, great work as allways.